After following my daughter in laws Mommyblogs, I grew curious about blogs for grandmothers. Interestingly, I have been struggling to come up with a non candy, non "fluffy bunny" Easter gift for grandsons aged 1 to 3 years old. What a find, all at one time! 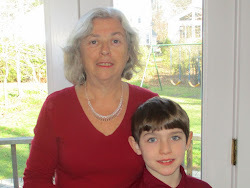 An intelligent grandmother blog and a gift idea that can be mailed to grandsons. Many Thanks. Thanks so much for your comment and entry in the giveaway. Grandmothers do have a different perspective than parents and I enjoy writing about things from a grandparent perspective. If you are on facebook, and you like The grandma Chronicles, you will see when I have a new post as I always post it there. It's so helpful to have someone else review an item - someone in the same situation as you. Namely, being a grandparent that wants to buy a clever, fun, cute gift for their grandchild, as opposed to another plush animal or candy. My grandson is 18-months and I think this item would really "hit the spot" with him.